It pulled up an absolute gem, a report published by Ofcom, the UK government's communications supremos. It was written by an outfit called Actual Experience, which does not sound very convincing, but is the commercialisation of 10 years of academic research by Professor Jonathan Pitts of Queen Mary University of London. He and his team developed not just mathematical modelling but embedded tools to measure the real performance of broadband to the home, and to small businesses. You can read the whole report by scanning this QR code. It's a good, largely accessible read. Now I am quite interested in broadband performance to the home, as and I am sure I have told you this before I am one of the many, many victims of BT and their relentless over-marketing and under-delivering. Despite continually promoting its Infinity fibre service and speeds of up to 76Mb/s, it is actually pretty hard to get. I live in a reasonably large and very affluent town in the south-east of England, in a large housing development that is less than 10 years old. The best that BT will offer me is a promise of 5Mb/s and a guarantee of 1.5Mb/s, which I think we would all agree is shocking. In fact my actual line speed quite often creeps up around 8Mb/s, so I suppose I should stop complaining. Anyway, back to Professor Pitts. His work involves tracking the performance of what he calls digital users (DU), which are little software packages running on hosts around the country. I've downloaded it, and it is running as I type. This continually calculates internet performance, and reports back to his analytical engines, to improve the national map of quality of experience. The benefit to the individual hosting the DU is that you get a neat dashboard which shows you how well your connection is performing, and what you might do to improve it. The research identifies four steps in the digital supply chain, the path from the host of the information you are seeking to your screen. Working backwards, these are the home (your own network, wired or wireless), access (the last mile connection), your ISP, and upstream the rest of the internet. To call content from, say, Netflix or iPlayer, your requirements go up through these four layers to the service provider, and the content comes back down through them. Impairments to the service can come from any of those layers. What the report does not say, but which seems to me to be obvious, is that if they are all working in perfect harmony and the content is still unwatchable then it is the service provider which is at fault. Just to get back to raw speed for a moment, Ofcom defines superfast broadband as 35Mb/s or better. For me, I would suggest it is time to drop the super from that, but that is neither here nor there. What the report suggests is that, above about 10Mb/s, there is little correlation between the line speed and the quality of experience. I can sort of understand that. The line speed is just the access part of the four-stage digital delivery chain. Yes, the faster the better, but beyond a certain point you can be limited by other factors in other parts of the supply chain. Professor Pitts calls his calculations the digital voice of the customer a name which suggests it was coined by a computing professor at the University of London. The dVoC (see: I'm into IT so I randomly apply capital letters) is a metric which determines the performance of the complete supply chain. 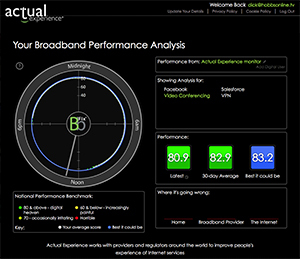 Individually, it can help you understand your level of performance; collectively it is a good measure of Britain's internet performance. If you are in the internet business in any way (or just interested) you can have your own access to the realtime data there is a free app on the iTunes store, for instance and adjust your own organisation's performance if needed. Now the interesting thing is that, despite the woeful performance of my broadband connection, my own DU is currently telling me that I am currently achieving a score of 80.9; the best it could be, it says, is 83.2. A score of 80 or above is officially described as digital heaven. The seventies are occasionally irritating, the sixties are increasingly painful, and lower still is just horrible. Even with a broadband connection the equivalent of a wet piece of string, I am assured I am in digital heaven. So web sites which take forever to load like asking BT when I might get Infinity are the fault of the servers on which they are hosted, not the complex digital supply chain between there and here. Online delivery of content is without doubt the future. We all need to understand digital supply chains and quality of experience. Which just might be slightly more complicated than we think.